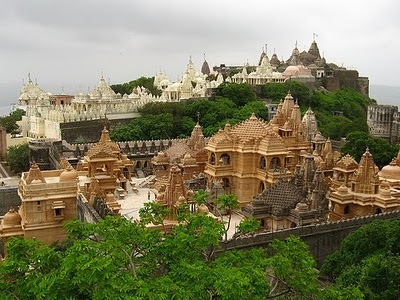 The Beautiful Palitana is a Religious Jain city , Bhavnagar district in the Indian state of Gujarat. It is located 50 km South-West of Bhavnagar city and is a major pilgrimage centre for Jains.The town is considered by many Jains to be more important than the temple covered hills of Jharkhand, Mt Abu and Girnar. Palitana was the capital of a princely state of the Gohil Rajput clan. It is also one of the greatest tourist attractions in Gujarat for foreign tourists. Every year millions of people come to visit these temples. Palitana is the place where millions and millions of Jain sadhu and muni got salvation . For the Svetambar Jains Shetrunjay is the earliest and, next to Sammet Shikhar in Bihar, the most sacred mountain .The Palitana temples are considered the most sacred pilgrimage place (tirtha) by the Jain community. There are more than 1250 temples located on the Shatrunjaya hills. The main temple on top of the hill, is dedicated to 1st tirthankar lord Adinath (Rishabdeva). On the top the Shatrunjai Hill is a cluster of Jain temples ( 873temples ), built by generations of Jains over a period of 900 years, from the 11th century onwards. However, destroyed by the Muslim invasions in 14th and 15th centuries, the temples were built anew in 1500. The temples are managed by the Anandji Kalyanji Trust of the Kasturbai Lalbhai group. From the foot of the hill to the top there are 3,800 and odd stone steps cut to facilitate climbing.